A boozy pipe dream became reality for beer lovers in Belgium today as a Bruges brewery poured its first glass of ale delivered through a 2 mile-long long underground pipeline from an out-of-town bottling plant. "It’s a fantastic feeling," Xavier Vanneste, the brewery's owner, told ABC News today of the pipeline's completion, "We had this crowdfunding campaign to fund our pipeline. So it is very exciting to receive the crowdfunders from all over the world, we promised that we would invite them for the opening." The brewery, De Halve Maan, has been in Vanneste's family for six generations and is located in the historic heart of the city of Bruges. Despite its long standing in the city, De Halve Maan has faced a predicament over the last few years ago. Having expanded and built a brewery and bottling plant in an industrial area -- about two miles from the brewery and an adjoining pub and restaurant -- it proved difficult getting the beer to the patrons. Originally they transported the beer with tanker trucks, but they proved ineffective in the narrow, cobble-stoned streets that line the historic center. Workers at the brewery got the idea to build an underground pipeline to transport the beer, Vanneste told ABC News, but at first many people thought it was a joke. But after coordinating with a series of special engineers and gaining support via an international crowdfunding campaign, the pipeline has now been completed. (Eric Vidal/Reuters) A driver walks near his truck as he collects beer from De Halve Maan brewery in Bruges, Belgium, Sept. 15, 2016. "It goes under the canals, under the roads, under big traffic points," Vanneste told ABC News earlier this summer, "We were not allowed to pass under private houses, but we could go under public roads." "The cost was about 4 million euros," Vanneste added, saying they turned to the community to help with the cost of construction. Vanneste said that the beer pipeline became the biggest crowdfunding operation ever done in Belgium. The beer will travel through the pipeline at a speed of about 3 meters (about 9.8 feet) per second, according to Vanneste. The pipeline is expected to deliver about 5,000 to 6,000 liters (about 1,320 to 1,585 gallons) of beer an hour. Vanneste said today that they did a lot of work to ensure the pipeline would not impede the quality of their beloved beer. "We did a lot of testing, with beer and with water, to see how the beer would behave in the pipe, and to see the quality. It is quite interesting to see what the impact would be on the beer quality and after a couple of weeks of testing we are able to say that it is perfect quality beer," Vanneste said. 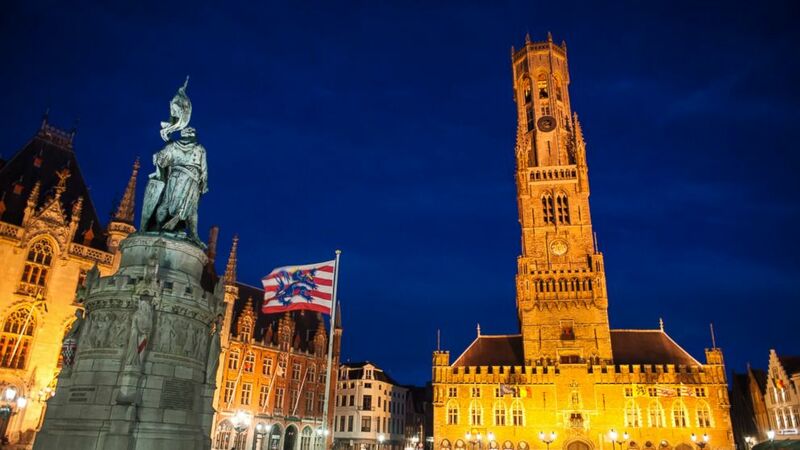 (NurPhoto via Getty Images) The Belfort of Bruges is illuminated at night in Bruges, Belgium, Sept. 16, 2015. 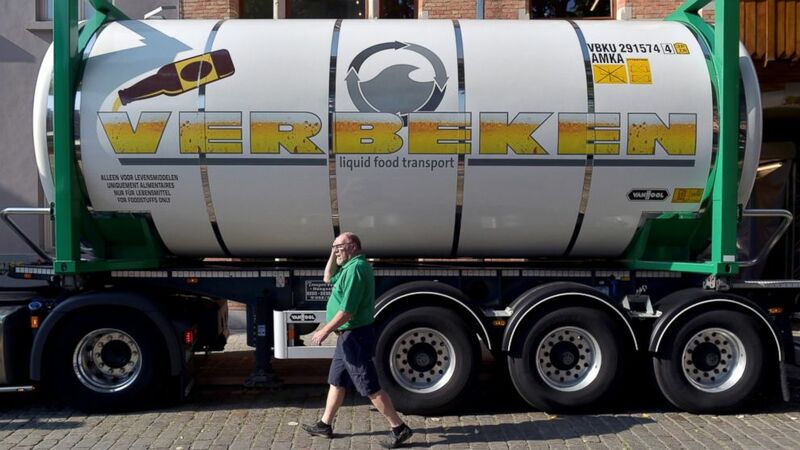 Vanneste added that he is especially happy with how this pipeline will help ease the brewery's environmental impact by taking many tanker trucks off of the road, and ease congestion in Bruges narrow streets. "We were getting kind of limited with the trucks, we couldn’t continue to increase the number of trucks on the road," Vanneste said, "We have a good solution now with the pipeline. We have now the possibility to expand and increase our amount of brewing." Friday’s grand opening was due to be attended by the city's mayor, among other dignitaries. "We have half of the Flemish government coming, five of the ten ministers wanted to be there," Vanneste told ABC News today, including the Flemish Minister of Education, the Minister of Economy, and the Minister of Energy. But for time being, at least, those wishing to sample the beer will have to come to the brewery. Despite pleas from locals to have the beer piped directly into their homes, Vanneste says they have yet to expand the operation that far.